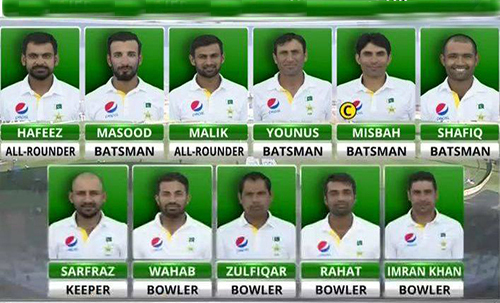 ABU DHABI – Pakistan captain Misbah-ul-Haq won the toss and decided to bat in the first test against England on Tuesday. Misbah’s team suffered a jolt even before the toss of coin with key leg-spinner Yasir Shah, the fastest man to 50 test wickets in Pakistan history, being ruled out with a back injury sustained on Monday during the final practice. Shah’s exclusion, and his replacement with seamer Imran Khan, will be a boost for England, who struggled against the spin of Saeed Ajmal in 2012 at Pakistan’s adopted home in the United Arab Emirates. Eyes will be on their batting stalwart Younis Khan, with the 37-year-old only 18 runs short of Javed Miandad’s record for highest (8832) test runs by a Pakistani batsman. For England, Mark Wood takes the final seamer position after Steven Finn was ruled out with a foot injury and Moeen Ali will partner Alastair Cook at the top. As expected, Adil Rashid makes his test debut on a ground where temperatures could exceed 40 degrees Celsius through much of the match.